NEW DELHI: The standoff in Tihar Jail is likely to be over with Anna Hazare set to come out of the prison after a night-long protest demanding that he be allowed to launch his indefinite strike from a venue of his choice in the capital. Hazare, who was ordered to be released on Tuesday night after a day-long detention before he was to begin his fast demanding strong Lokpal, had refused to come out of the prison unless he was allowed to protest fromJP Park without conditions. Activists Kiran Bedi and Swami Agnivesh announced to the hundreds of supporters waiting since Tuesday night that the 73-year-old Gandhian was about to come out of the prison anytime now. "The government has bowed down. We will have to be prepared to go to JP Park in a peaceful manner," Agnivesh said. RTI activist Akhil Gogoi said government has given enough indications to Hazare that he can launch his protest from the park without conditions. However, lawyer Prashant Bhushan told reporters outside that "we have no information or confirmation yet whether the government has conceded to the demands of Hazare that he will be allowed to sit on fast in JP Park without any conditions on the number of days". Police arrested him on the ground he was about to commit a cognisable offence but in a sudden turn of events government decided to release him after protests erupted across the country against its action. Addressing the crowd outside Tihar jail, Bhushan, one of the close associates of Hazare, said "today's protest represents the significance of people's struggle not just against corruption but a shot in the arm for democracy". Gandhian Anna Hazare was jailed in New Delhi on Tuesday morning before starting his fast for an effective anti-corruption law, sparking mass protests that drew tens of thousands across India. Stunned by the People Power, authorities did a U-turn within 12 hours and freed him but the former soldier refused to walk out of the jail until he was allowed to hold his planned fast without any fetters. Just six hours after he was driven to the Tihar Jail after 3pm after being sentenced to a week's judicial custody, an unprecedented outburst of spontaneous public anger led Delhi Police to release him. But Hazare, 74, having tasted victory, declined to move until his demands were met. Hazare confidante Kiran Bedi -- a decorated former police officer who too was detained but released within hours -- said the Gandhian was determined to pursue his fast at the JP Park in the heart of the capital -- minus the prohibitory orders imposed by police. She said he would not leave Tihar Jail until this condition was met. The day-long drama effectively left the government floundering, with Congress leaders struggling to defend their earlier hardline stand against a Gandhian who has become an icon in India's war on corruption. In the evening, Congress general secretary Rahul Gandhi called on Prime Minister Manmohan Singh who earlier convened a meeting of senior ministers to discuss the tense situation -- and the likely political fallout. "We can apologize" for arresting Hazare, Congress spokesperson Renuka Chaudhry said late in the evening, as protests in support of the man raged in numerous places, principally in New Delhi and Mumbai where thousands poured out of their homes holding Indian flags, cloth banners and posters. As night broke, crowds in the capital only swelled, mainly outside Tihar Jail and the Chhatrasal sports stadium in another corner of the city where hundreds had been detained for siding with Hazare. Tihar Jail spokesman Sunil Gupta said shortly before 9pm that Hazare had been let off from his cell but he was in the prison office, talking to officials and refusing to leave. Eminent jurist Soli Sorabjee said the government had tripped badly. "What is happening in the government?" Sorabjee asked on TimesNow television. "This is a gigantic folly, a gigantic miscalculation" by the government. The widely condemned arrests of Hazare and his key associates crippled parliament as an otherwise divided opposition closed ranks. The Bharatiya Janata Party and the Communist Party of India-Marxist called for protests across India Wednesday. "The reaction is tremendous all over India," said former Supreme Court judge Santosh Hegde in Bangalore, one of scores of cities that saw numerous small and big demonstrations in support of Hazare. "People are pouring out their anger." It all began shortly after 7am when policemen in civilian clothes swooped on Hazare and trusted activist Arvind Kejriwal as they stepped out of a middle class apartment in east Delhi. They were to begin their hunger strike, in violation of police orders, for a strong lokpal bill in place of the government-sponsored one that excludes the prime minister, the judiciary and a mass of junior government officials from its purview. As hundreds blocked a main road, the police were stuck with Hazare and Kejriwal. Eventually he was taken to the police officers' mess in another part of the city, then to another office and finally sent to prison when he refused to sign a bail bond. Before being detained, Hazare -- aware that he could be arrested -- said in a recorded video message: "Don't let my arrest stop this movement. This is the nation's second struggle for freedom." The message had an electrifying effect. In towns and cities across India, spontaneous protests erupted. Tens of thousands took to the streets shouting slogans against the government and hailing the Gandhian. The biggest shows of solidarity were reported from New Delhi and Mumbai. Apart from major cities such as Bangalore, Chennai, Kolkata, Hyderabad, Chandigarh, Lucknow and Ahmedabad, numerous big and small protests took place in Udaipur, Jammu, Selam, Bhopal, Surat, Rajkot, Patna, Guwahati, Raipur, Shimla, Mandi, Amritsar, Ludhiana, Bhiwani -- and many more. The people who took to the streets were dominantly from the middle class -- sick and tired of India's endemic corruption. There were men and women, from vocal teenagers to spirited men even in their 80s. There was no case of violence anywhere in the country. Once Hazare was taken to Tihar Jail, large numbers offered themselves for arrest here. The number swelled to around 1,400, by official admission. After a while police refused to arrest any more saying that the makeshift prison -- Chhatrasal stadium -- was overflowing. Activists insisted that up to 5,000 had been detained. Senior ministers justified the arrest but sounded defensive. Human resource development minister Kapil Sibal even suggested that Hazare could again talk to the government over the proposed lokpal bill. Ministers denied that Delhi Police acted under political pressure. FEROZEPUR: Representatives of different NGO's sat on dharna at Shaheed Udham Singh Chowk on Tuesday, to support Anna Hazare's fight against corruption and to protest his arrest. The NGO's criticized the Delhi police and UPA government for the undemocratic arrest; they demanded an early release of Anna and his aide. Subash Tuli a businessman said the incident has exposed the real face of the UPA government, which never wants the truth to unfold. The NGO's have also planned a candle light march in the evening to spread the message among fellow residents. Professor K.C. Arora said until the corrupt leaders are overthrown nothing worthwhile will happen, he claims that Anna's campaign had nothing to do with winning elections. "It is the call of the time that clean politicians like Anna should come forward and take the lead to construct a new corruption-free India. After all what is wrong in wanting to boot out corrupt rascals and trying to "reboot" the country," he added. Young Municipal Councilor, Davinder Bajaj said it is time to put strong resistance in front of the old political, administrative and social set ups. He claims that only then will it be possible to create a new, corruption-free India. NEW DELHI: Social activist Anna Hazare has refused to leave Tihar Jail till he is allowed to hold his planned fast at JP Park, according to his close confidante Kiran Bedi. Speaking to reporters outside Tihar Jail, Bedi said Hazare wants no restrictions on his fast and after his release, plans to go to the venue to continue his fast for a strong Lokpal Bill. Bedi said Hazare also wants Section 144 - that prohibits the gathering of five or more people - lifted from the venue, located next to Feroze Shah Kotla ground in the heart of the capital. According to Manish Sisodia, another of Hazare's close aides, who was with him in jail and released in the evening, the 74-year-old activist is continuing with his fast that he began in the morning. Four others were also released with Sisodia. JAMMU: After the arrest of social activist Anna Hazare in New Delhi, protests erupted in Jammu on Tuesday. The protests started by different organizations at the Press Club Jammu. Meanwhile Jammu artists enacted 'Main Bhi Anna' to create awareness against corruption. As news of the arrest spread, small groups of people took to the streets to support the Gandhian, whose proposed fast had been banned by Delhi police. Carrying placards which read "We support Anna Hazare and Down-Down UPA Govt, etc' the protestors were seen at Purani Mandi, Talli Morh Janipur while lawyers held massive protests atJanipur High Court road. B S Salathia, president of the Jammu Bar Association who led the protest of lawyers in Jammu after suspending work in courts said, "We are with Anna Hazare and his campaign against corruption as it is ailing our whole system. Lawyers in Jammu will continue to hold protests against corruption." Panun Kashmir and SOS held protests at Press Club Jammu; these organizations are made up of Pakistani Kashmiri's who became refugees in 1947. Spontaneous demonstrations were also reported from Satwari locality, Old City areas and several other places. In the play enacted by Jammu artists, Dilshad Shazi, played Anna Hazare and took the centre stage with other actors joining him as 'aam janta' and supporting the valuable cause of saving a nation from turning into a total wreck. The play stressed on the need for a change in the society for an overall betterment of human beings and termed corruption as the cancer in the society. Aaditya Bhanu directed the play and Nav Durha Kala Manch presented it. Hazare and his associates, including activists Arvind Kejriwal and Kiran Bedi were also arrested early on Tuesday. NEW DELHI: Commuters in the city may face hardship tomorrow as a major auto-rickshaw union has called for a one-day strike to protest the arrest of social activist Anna Hazare. "All the auto drivers affiliated to our union have been asked to stay off the roads tomorrow to mark our protest against the arrest of Hazare," said Rakesh Agarwal of 'NyayaBhoomi'. Agarwal claimed the union has a membership of over 10,000 auto drivers. 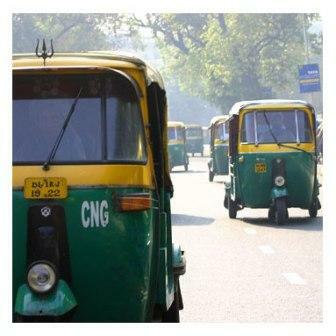 "Like all other citizens of the country, auto drivers are too badly affected by corruption. 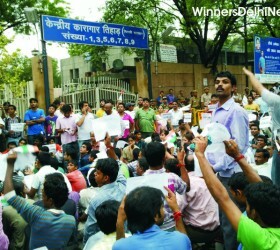 And we condemn the way the Government is trying to crush the anti-corruption movement led by Hazare," Agarwal said. Agarwal also said that all auto-drivers, belonging to the union, have been asked to participate in a protest march from India Gate to Parliament House tomorrow. NEW DELHI: In a dramatic turn of events, Anna Hazare and his associates are being released tonight from Tihar Jail after police decided to withdraw its case against them. Delhi Police sources said that warrants of release have been sent to Tihar Jail authorities for freeing Hazare and his seven associates who were held this morning ahead of their plans to launch an indefinite strike for a strong Lokpal. The sources said the decision to release was taken after government is understood to have come to the a conclusion that keeping him in jail would create unnecessary law and order situation. 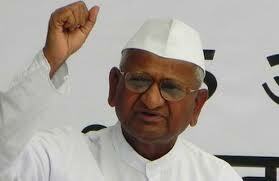 Hazare and his associates had refused to take food during their detention under judicial remand. Meanwhile, civil rights activists Kiran Bedi and Shanti Bhushan, detained by Delhi Police Tuesday morning ahead of Anna Hazare's fast-unto-death, were released in the evening, police said. "Kiran Bedi and Shanti Bhushan have been released," Delhi Police spokesperson Rajan Bhagat told reporters. He said theirs was "preventive arrest". Bedi and Bhushan were detained under the Delhi Police Act, on charges of refusing to comply with the directions given by a police officer. Hazare, fellow activist Arvind Kejriwal and six supporters were sent to Tihar Jail by a special executive magistrate for not signing a bail bond and promising not to violate prohibitory orders. Police had clamped prohibitory orders at the J.P.Park where the activists were planning to sit on fast against corruption.